Packing for a two week holiday was something I hadn’t done for years, so there was only one way to approach it – with a list of course! I started by picking out key pieces – white shorts, denim shorts, playsuits, jumpsuits and easy to wear dresses are all staples for me. I then mixed it up a bit with a few off the shoulder tops and some fun accessories to complete each look. 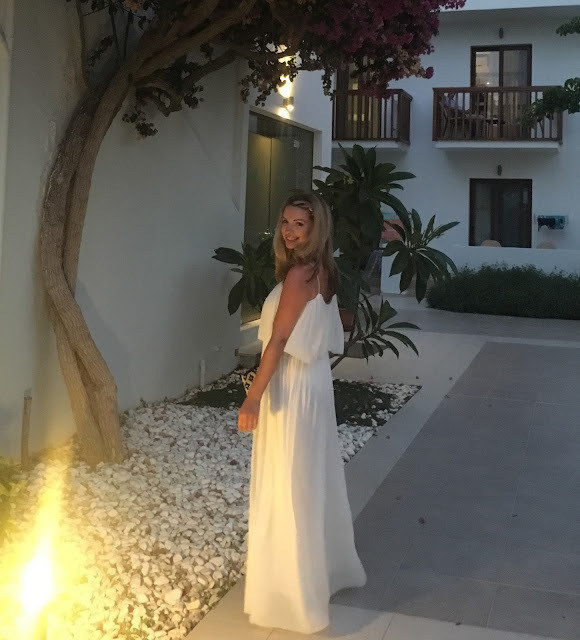 One tip I swear by is to try everything on before you go and only bring pieces that you are truly comfortable in – nobody wants an ‘I don’t have anything to wear’ crisis in the hotel room! Be selective and try to think by outfit, rather than throwing random pieces into the suitcase. I tried, where possible, to bring complementing colours that allowed me to mix and match my separates with ease. I had these shorts from River Island last year and previously teamed them with a black cami. When I saw this top in New Look, I thought it would be perfect to pick out the powder blue tones. I was delighted to collaborate with OnTrend.eu while I was in Kos and loved wearing this blue playsuit. It was perfect for a Greek themed night and so comfy! I packed lots of white as it’s so easy to wear with a tan. The skort is a few years old from Zara, updated with a studded cami top from River Island. Another night, another playsuit! This one is from Mango last year and I teamed it with my Pom Pom sandals from Penneys. I loved the pop of neon pink and orange and they were so fun to wear! I fully embraced the off the shoulder trend over the two weeks – at this point I think I have a bardot top or dress in every colour of the rainbow! It wouldn’t be holidays without a maxi dress or two. These are both old reliables but you’re sure to find similar on the likes of ASOS or Missguided. For my birthday night, I pulled a Penneys dress out of my wardrobe that I had bought years ago but never worn – tags on it and everything! Does anyone else do that?! Shoes are always so hard to narrow down when it comes to holidays! 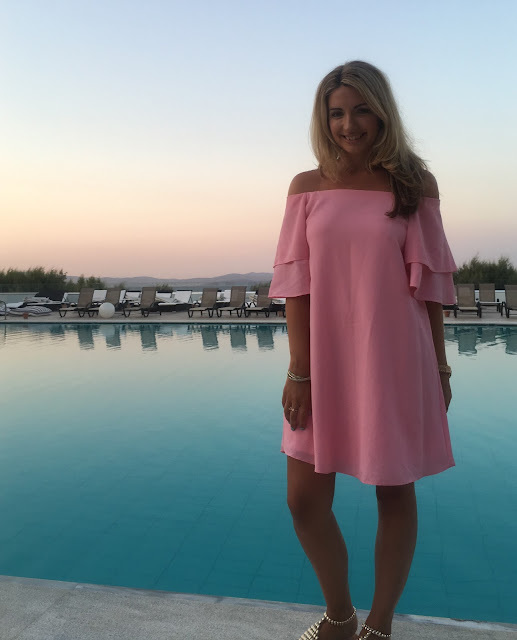 I ended up living in two pairs of block heeled sandals that I picked up before going away – a silver pair from Penneys that went with absolutely everything and a fab tan colour from River Island which again, were so versatile. For those who are still reading, thank you – this must have been my longest blog post to date! I’ve linked as much current season pieces as I could find but it’s worth checking out what’s left in the Zara and River Island sales for the pieces that have sold out online. Previous Post Denim Shirt dress with white jeans….